Meet Lydia: Lydia Schoch is a blogger, reviewer, and science fiction author who lives in Toronto. She enjoys lifting weights, alliterating words, meditating, and playing board games in her spare time. She does not enjoy brussels sprouts. Follow her @TorontoLydia on Twitter or at her site, http://lydiaschoch.com. I was homeschooled for several years when I was growing up. My family didn’t have cable, and our television only received a few channels in general. This meant that books were by far our most reliable form of entertainment, especially since we lived in Wyoming then and were occasionally snowed in by blizzards! Margaret Atwood. I admire her ability to build three-dimensional worlds in her books, especially when she does it in a scant few paragraphs. 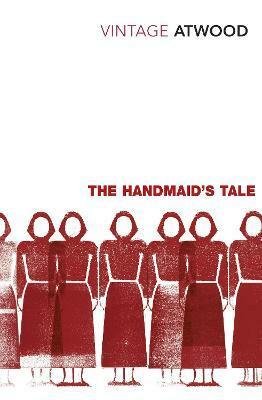 “The Handmaid’s Tale” by Margaret Atwood for adults. I’d recommend the Chronicles of Narnia series by C.S. Lewis for kids because I think his work is a wonderful introduction to the fantasy genre. 5. Who are some of your favorite book bloggers or bookstagrammers that you follow? Wow, it was hard to narrow this down. I follow so many amazing book bloggers, but these folks are the cream of the crop because of how descriptive their reviews are and how much effort they put into describing exactly why a book did or didn’t work for them. While I’d love to go to the world Jean M. Auel created for her Earth’s Children series so I could see mammoths in person, I think I’d probably live longer in J.K. Rowling’s Harry Potter series. Also, it would be quite interesting to taste real butter beer. 7. Are you a fan of book to movie adaptations?Why or why not? Yes, I’m generally a fan of book to movie adaptations. Most of them are well done, and I always enjoy seeing how the screenwriters and directors adapted scenes that worked well in a book but might have needed some tweaking in order to be equally effective for big-screen audiences. This cover of Octavia E. Butler’s amazing novel, “Parable of the Sower”: https://www.amazon.com/Parable-Sower-Octavia-Butler-ebook/dp/B008HALO4Q/ref=sr_1_1?keywords=parable+of+the+sower&qid=1554078325&s=gateway&sr=8-1 I came extremely close to choosing her as my all-time favourite author. She was an incredible storyteller, and the world would be a better place if she were still with us. 9. What’s your most anticipated release?Margaret Atwood’s “The Testaments.” I’ve been dreaming of a sequel for “The Handmaid’s Tale” for many years. Hopefully, it will be wonderful. Science fiction is my favourite genre. My favourite trope from it is faster-than-light travel because of how much easier it makes the idea of travelling from one solar system to the next. Killer aliens are my least favourite trope. Why do we so easily assume they want to hurt us? Maybe they just want to meet other sentient life! Coffee or tea? Tea, preferably peppermint or herbal. Favorite TV show? The Orville. I love its cheerfulness and unflappable optimism about the future. Favorite season? Season 2 (the current season). It just keeps getting better with each episode, so I expect this answer to change every time they make another season of it. Favorite candy? Sun Cups. They’re dairy-free peanut butter cups made by a company that specifically caters to people with food allergies. As someone who has a milk allergy, it makes me pretty happy to have products like this. Describe yourself in 3 words. Inquisitive. Innovative. Introverted. Do you have any pets? No. I love animals, but I’m pretty allergic to many mammals. If I could have mammals as pets, I’d want to live with a couple of rabbits. They’re such playful creatures. Thank you so much to Lydia for taking your time to answer these questions! If you’re interested in being interviewed for my blog, click here! Thank you! Yes, that show is amazing. I can’t wait to see what they do with future seasons. Great interview Lydia! Nice to get to know you better. 🙂 I love the idea of visiting Auel’s world- I too would love to see mammoths, and just a world totally undeveloped. Although I’d want to make sure I could get back too, as being stuck there might NOT be good haha! I finally made the switch to self-hosted!